242 Beacon is located on the north side of Beacon, between Dartmouth and Exeter, with 240 Beacon to the east and 244 Beacon to the west. 242 Beacon was designed by Sturgis and Brigham, architects, and built in 1880 by Woodbury and Leighton, builders, for Thomas Dennie Boardman and his wife, Anna (Annie) Fearing (Leeds) Boardman. He is shown as the owner on the original building permit application, dated April 30, 1880. They previously had lived at 245 Beacon. They also maintained a home in Manchester. T. Dennie Boardman and Anna Boardman purchased the 31 foot wide lot for 242 Beacon on February 7, 1880, from real estate dealer Henry Whitwell. It was the eastern portion of a 40 foot lot Henry Whitwell had purchased on February 6, 1867, from William Gardiner Prescott, who had purchased it from the Boston and Roxbury Mill Corporation on October 20, 1863. Click here for an index to the deeds for 242 Beacon. T. Dennie Boardman was a leather merchant in his father’s firm until the late 1880s, when he became a real estate dealer. The Boardmans lived there until about 1883, when they moved next door to a new home they had built at 244 Beacon. On September 19, 1882, 242 Beacon was purchased from the Boardmans by Ellen Louise (Tileston) Hemenway, the wife of Charles Porter Hemenway. They previously had lived at 222 Beacon. They also maintained a home in Swampscott. Charles Hemenway was a shipping merchant in the South American trade in the firm of Hemenway & Browne, established by his brother, Augustus Hemenway. Charles and Ellen Hemenway previously had lived in New York City. They returned to Boston after the death of Augustus Hemenway in 1876 and Charles Hemenway became managing partner of the firm. Augustus Hemenway’s wife, Mary, was the sister of Charles Hemenway’s wife, Ellen. Charles Hemenway died in January of 1893. Ellen Hemenway continued to live at 242 Beacon with their four daughters: Mary Austin Hemenway, Eliza Tileston Hemenway, Clara Hemenway, and Caroline Tileston Hemenway. Eliza Hemenway married in April of 1899 to George Edward Cabot and they moved to 169 Marlborough. Caroline Hemenway married in January of 1905 to Charles Wilson Taintor. After their marriage, they lived with Mrs. Hemenway at 242 Beacon during the 1905-1906 and 1906-1907 winter seasons, but moved thereafter to 304 Marlborough. Ellen Hemenway died in December of 1914. In her will, she left 242 Beacon to her four daughters. Mary Hemenway died in March of 1915, leaving her interest in the property to her sisters. On March 30, 1916, Eliza (Hemenway) Cabot and Caroline Taintor transferred their interests in 242 Beacon to Clara Hemenway. 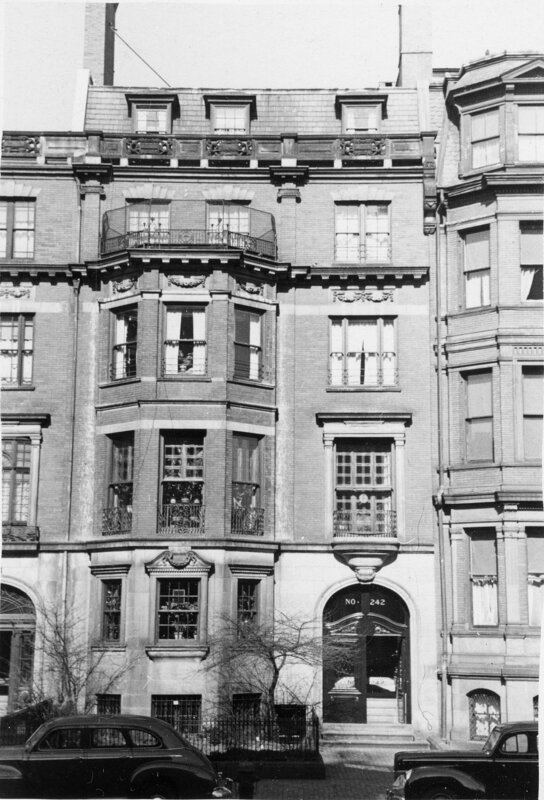 242 Beacon continued to be Clara Hemenway’s home until her death in August of 1918. She died intestate and 242 Beacon was inherited by Eliza Cabot and Caroline Taintor. The house was not listed in the 1918-1920 Blue Books. On February 28, 1920, 242 Beacon was purchased from Eliza Cabot and Caroline Taintor by Madeline (Jackson) Lee, the wife of investment banker George Cabot Lee, Jr. They lived at 285 Beacon. One week later, on March 5, 1920, Madeline Lee died of a heart attack while attending a reception at the Chilton Club at 152 Commonwealth. Later in March of 1920, George Lee applied for (and subsequently received) permission to remodel 242 Beacon, including expanding the attic floor by rebuilding the “front sloping roof … to get three new bed rooms” and making other interior changes. The remodeling was designed by architects Parker, Thomas, and Rice. Plans for the remodeling – including a front elevation, floor plans, and floor framing plans – are included in the City of Boston Blueprints Collection in the Boston Public Library’s Arts Department (reference BIN G-23). George Lee and his three sons — George Cabot Lee, III, James Jackson Lee, and Nelson Borland Lee — moved to 242 Beacon when the remodeling was completed. He also maintained a home in Westwood. In July of 1926, George Lee married again, in Paris, to Gertrude Wildes (Cramer) Bartlett, the widow of Edwin R. Bartlett. On July 16, 1926, 242 Beacon suffered a serious fire, causing the death of a carpenter working there at the time and seriously damaging the house and its contents. The library on the second floor was being remodeled and the Boston Globe’s article on the fire indicated that “it is thought that someone tossed a lighted cigarette into a can of paint remover, causing an explosion and flames a considerable distance on the second floor.” In August of 1926, George Lee filed for (and subsequently received) permission to repair the damage. The house was not listed in the 1927 and 1928 Blue Books. On June 9, 1927, 242 Beacon was acquired from the Lee family by banker Gordon Abbott. 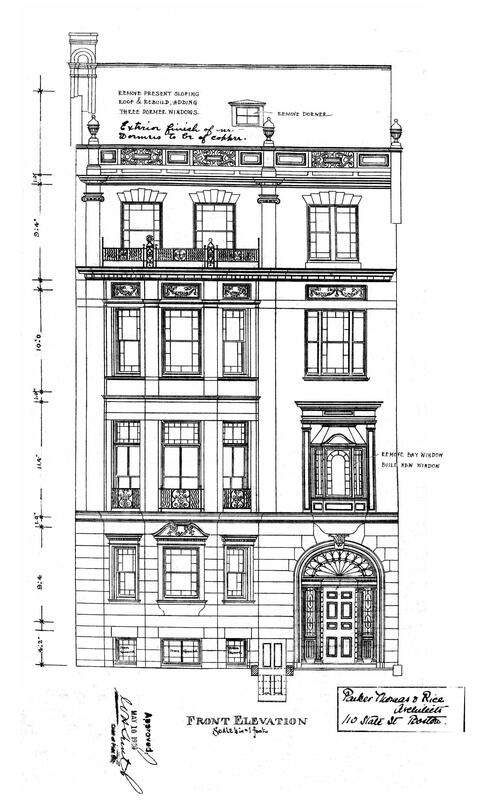 He and his wife, Katharine McLane (Tiffany) Abbott, lived at 240 Beacon, and it appears likely that he acquired 242 Beacon in order to ensure that the repairs to the house were completed in a manner consistent with their interests as abuttors. 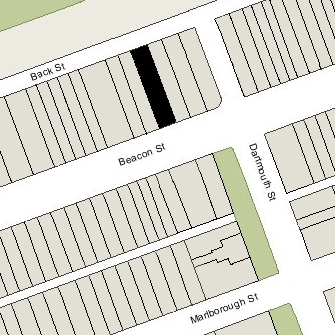 On September 7, 1927, Gordon and Katharine Abbott joined with their neighbors at 236-238 Beacon and 244-246 Beacon in an agreement prohibiting for ten years (until January 1, 1938) any new building or structure behind their houses any taller than 26½ feet. On August 30, 1928, 242 Beacon was purchased from Walter Gleason by Godfrey Lowell Cabot. He and his wife, Maria Buckminster (Moors) Cabot, made it their home. They previously had lived in Cambridge. They also maintained a home, The Oaks, in Beverly Farms. Godfrey Cabot was a chemist and a major manufacturer of carbon black and gas. He also was a pioneer aviator. In the 1920s and 1930s, he was one of the leaders of Boston’s Watch and Ward Society which, among other things, sought to ban books which it considered immoral. In September of 1928, Godfrey Cabot filed for (and subsequently received) permission to repair fire damage to the front and rear staircases, presumably completing the repairs from the fire in August of 1926. In March of 1929, Godfrey Cabot applied for (and subsequently received) permission to construct a garage at the rear of the property. Plans for the garage, designed by architects Putnam and Cox, are included in the City of Boston Blueprints Collection in the Boston Public Library’s Arts Department (reference BIN P-61). It appears that the garage was never built. Maria Cabot died in November of 1934. Godfrey Cabot continued to live at 242 Beacon, joined by his son-in-law and daughter, Ralph and Eleanor (Cabot) Bradley. Ralph Bradley was vice-president and treasurer of his father-in-law’s firm. Godfrey Cabot continued to live at 242 Beacon until his death in November of 1962. On April 29, 1963, 242 Beacon was acquired from Godfrey Cabot’s estate by Nubar J. Dinjian, George Najarian, Thomas Moranian, and John H. Avazian, trustees of the Penwood Realty Trust. In May of 1963, Penwood Realty applied for (and subsequently received) permission to convert the house from a single-family dwelling into nine apartments. As part of the remodeling, it added a penthouse on top of the existing top floor, which had been expanded in 1920. In September of 1965, Penwood Realty applied for (and subsequently received) permission to create a new apartment on the penthouse level, increasing the number of units to ten. Plans for the remodeling, designed by architect Leon Furr, are included in the City of Boston Blueprints Collection in the Boston Public Library’s Arts Collection (reference BIN R-250). On April 7, 1969, 242 Beacon was acquired from the Penwood Realty Trust by Marguerite (Moranian) Dinjian, the wife of Nubar Dinjian and sister of Thomas Moranian. By 1973, 242 Beacon was owned by Nancy E. McCarthy and Nanette Plotkin, trustees of the Godfrey Cabot Home Trust. 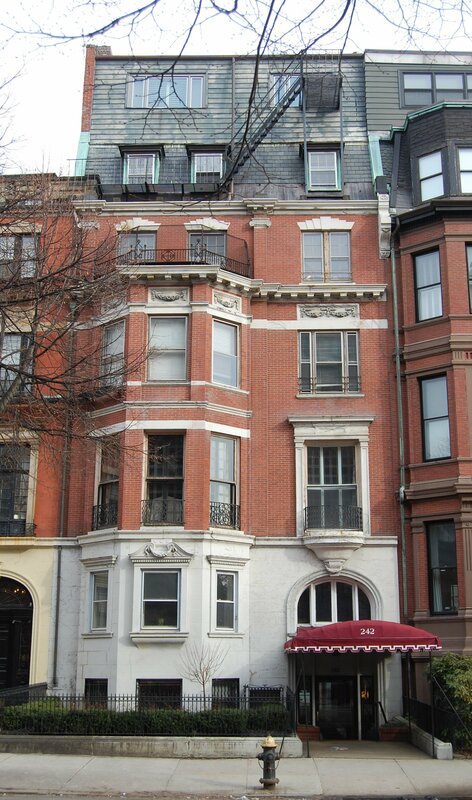 On November 30, 1973, they converted the property into ten condominium units, the 242 Beacon Street Condominium. In December of 1995, the two units on the penthouse level were combined and the number of units was reduced to nine.